Need a vision or direction for your life, career or business? Spiritual Spectra offers Goal Setting Consultations which provide the guidance, clarity and information you need. Goal Setting Consultations are Spiritual Consultations with the specific focus of creating a vision statement and goals for the client’s life, career or business. Clients will come away with a vision statement and a concrete plan of action which will list actions needed to be taken, challenges needed to be overcome and a timeline by which to achieve their vision. We offer Goal Setting Consultations in our Maryland office. We also offer the convenience of meeting at our clients’ business office/location in Maryland, DC and Northern Virginia (locations outside Central Maryland, DC & NOVA may incur an additional travel expense). Read further for cost and description. 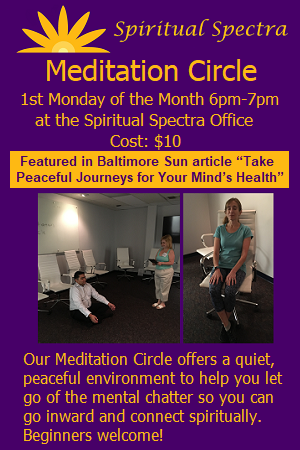 * Price is for appointments at Spiritual Spectra office and business locations within Central Maryland, DC & NOVA. Other locations may incur a travel fee. Choose the Goal Setting Consultation or Plan that is right for you. Clients can choose to pay in advance or on the day of the appointment (the Year-Long Plan does require advance payment). For appointments located at clients’ business location, payment must be made in advance. Goal Setting Consultations can also be offered as a workshop for civic, professional and networking groups. Contact us for pricing and to schedule. Being centrally located, our Goal Setting Consultations serve the following communities: Columbia, Ellicott City,Elkridge, Catonsville, Jessup, Fort Meade, Laurel, Fulton, Silver Spring, Clarksville, Highland and Olney, Maryland. Contact us to schedule an appointment today!